Last summer at ISTE, I discovered a must-read book about Universal Design for Learning (UDL). 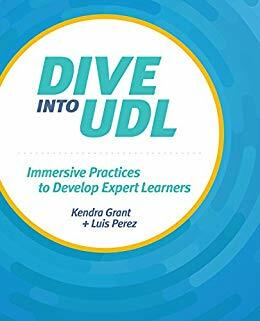 The book is called Dive Into UDL — Immersive Practices to Develop Expert Learners by Kendra Grant and Luis Perez. I started reading the book expecting to learn about accessibility in special education. Instead, I got a mind-expanding lesson in what the future of learning must be for all humans. I learned how UDL can help all students and teachers become expert learners. One of my favorite anecdotes in the book is about a Center for Applied Special Technology (CAST) Instructional Designer, Mindy Johnson. She took piano lessons as a child but, despite great effort, she couldn’t read sheet music. Instead, with her mother’s help each night she practiced the lessons and learned to play by ear. Later, Mindy was able to win competitions if she got the music ahead of time and could learn it by ear, but if she was given sheet music to play, she still couldn’t play at all. Was Mindy gifted based on her great ability to play by ear, or disabled, due to her inability to play from sheet music? This is a great example of not only how we try to box people into labels but also in how important it is to have a good fit between learners and their environment. This book defines UDL based on the CAST definition: “(CAST) defines UDL as a framework to improve and optimize teaching and learning for all people based on scientific insights into how humans learn (CAST, 2017).” Some of the best insights in the book are based around breaking down larger ideas into smaller bits to help you think through what learning really means. For example, learners can vary in what motivates them, in how they process learning, and in how they demonstrate learning, ie: the WHY, the WHAT and the HOW of learning. UDL provides students and teachers with various options for each of these three areas of learning. As groups like CAST and others working with Universal Design began to work on tools and processes to help give more access to students with disabilities, they realized these tools can help any student become a better learner. Indeed, a large part of this book is about teaching teachers as well as students how to be expert learners. As acceleration of change intensifies throughout the world, learning to learn becomes more and more important. The content that is important to learn today may not be important tomorrow. Teaching students to be motivated and flexible learners will be the most valuable gift you can give them. Over the years as educators researched ways to use technology to help disabled students, they found fabulous tools to help level the playing field; however, they also bumped up against systemic barriers to learning that can still be found in classrooms today. A viral visual that best explains this phenomenon is shown below. In the first panel students of differing heights try to see over a fence at a ball game. The second panel shows kids standing on boxes (scaffolding) to help them see over the fence. 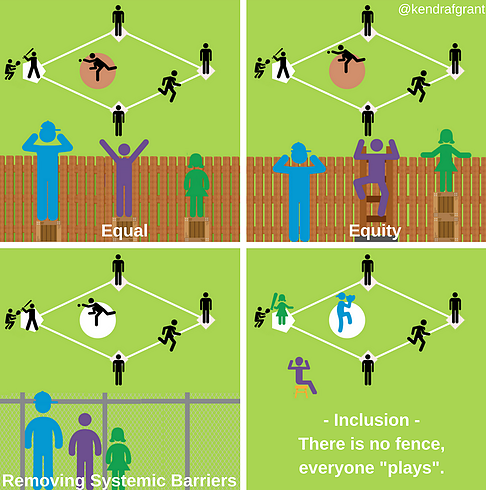 In the third panel the fence (systemic barrier) is removed entirely so that the kids can see the game. The key, the authors tell us, is to learn to remove your own filters so that you can see the systemic barriers and learn to make changes to remove them. Co-author Luis Perez informed me that co-author Kendra Grant created an updated image with a fourth panel that depicts inclusion. In this updated image there is no fence and all children get to play. Dive Into UDL gives teachers a fantastic overview as well as hands-on tips and resources for helping them expand learning for themselves and for students. The authors list the UDL Guidelines from CAST (2011, 2018) and the ISTE Standards for Students and Educators (ISTE 2016, 2017) as the main frameworks for the book. The book explains how to be “Empowered Learners, Empowered Professionals, and Learning Catalysts” — essentially taking control of our own learning and being agents of change. Read more about Dive Into UDL on the Drawp for School blog.